We've lost a number of classic films—even some Oscar-nominated ones. But occasionally, lost films will pop up in places where you least expect them. Such was the case with Walt Disney's first Christmas short, Empty Socks, which was rediscovered at The National Library of Norway in 2008. A restored version of the film was shown at the library earlier this week. The silent film—which stars Mickey's predecessor, Oswald the Lucky Rabbit—was originally released in 1927. It was found by two employees while they were taking inventory at the library's nitrate film archive. “At the beginning, we didn’t know it was a lost cinematographic treasure,” Kvale Sørenssen, an archivist at the library, said. “The film was in two reels which weren’t clearly labelled.” In fact, they first thought the film might feature Felix the Cat. The reels had belonged to Norwegian collector Tor Eide. Eide gave them to the Norwegian Film Institute, which gave its collection of nitrate films to the National Library in 2007. The film was authenticated by former Disney archivist David Gerstein. 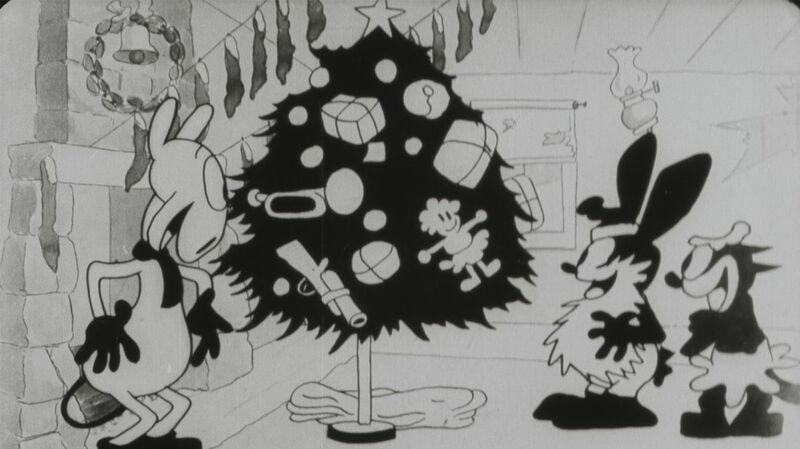 Empty Socks features Oswald dressing up and playing Santa to some mischievous orphans, who end up setting a chair—and eventually, the house—on fire. (Disney would reuse this general idea with Mickey Mouse in the 1931 short Mickey's Orphans.) Previously, only 25 seconds of the short was known to exist; that clip is held by the Museum of Modern Art in New York City. The full short was 5.5 minutes long, and the reels found in the National Library's archives are nearly complete—around a minute of the middle section of the movie, where Oswald distributes gifts to the orphans and the chair catches on fire, is missing. Restoration experts at the library painstakingly restored Empty Socks and digitized it. Restoring silver nitrate movies is a dangerous process because the film is highly flammable. According to the History Blog, “A little warmth or pressure and [the nitrocellulose compound used to make the film] explodes with more force than gunpowder. It doesn’t even need oxygen to burn because it produces its own oxygen during combustion. It also burns under water.” To keep both people and the films safe, The National Library of Norway's silver nitrate films are stored in a secure climate- and moisture-controlled bunker in Mo i Rana, near the Arctic circle. The facility is partitioned into sections with fireproof walls to minimize damage and danger in the event of a fire. A digital copy of Empty Socks has been sent to Disney, and the original will remain in the National Library's bunker.